LCHF, or Low Carb High Fat is the lifestyle that just makes the most sense to me (I like logical things and stuff that just naturally makes sense – can’t help it!). I grew up on a farm and I knew where my food came from. A lot of people these days don’t know where natural food comes from, and a lot of the products on supermarket shelves can no longer be referred to as food anyway. They mainly contain sugar, wheat and corn starch. Oh, and soy of course. Did you know that if you only walk around the outer isles of the supermarket, you will find everything you need, there is absolutely no need to go into the inner isles (unless of course you need toothpaste or toilet paper..). On the outside you will find vegetables, fruit, meat, fish, butter, dairy products and eggs. You really don’t need much more than that for a healthy lifestyle (except coconut milk, it is sometimes hidden away on the evil inside of the supermarket). But back to the LCHF. Low carb has been around for a long time and I believe having a lower carbohydrate intake is good for you. But, if you are eating low carb, where are you going to get the remaining energy from? I believe the answer to that question is fat. Natural fat, not the vegetable oils you find in plastic bottles in the inside isles (funny word; vegetable oil – when was the last time you ate a really fatty vegetable and thought, hmm I will make oil out of this?). The last 70 (roughly) years, low fat/whole grains has been the message that has been sent out to the masses from health specialists around the world. But, the world population are only getting fatter and fatter, even though many of them are following the low fat advice. 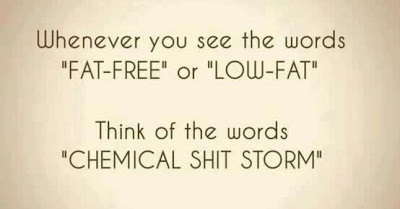 When you see the words low fat or fat free – think of the words chemical s**t storm! Because that is most likely what you are about to put in your mouth. When the fat (the flavour) is taken out, sugar and salt (flavour) amongst a lot of other suspicious things that are hard to pronounce are added, so you will actually enjoy eating it. Because, if not the consumers (you and me) wouldn’t buy it and the producers (the evil who pays for all the research to be done that low fat is good for us) wouldn’t earn any money. Good for them, ‘good’ for us (or at least that’s what we are made to believe). Obviously this is hard to believe, because we are so indoctrinated with how fats and especially saturated fats are bad for us. That’s what every nutritionist is taught in school, that’s what the government recommendation for a healthy diet is telling us and every ad on TV about a new healthy product is low in fat (and generally high in carb). So when someone tells you fat is good for you and can’t actually make you fat, you just go “that’s impossible” or “of course fat is making you fat, that’s why it’s called fat”. So, you really just have to try it for yourself to decide what you want to believe in. All I know is that I feel so much better with a LCHF lifestyle, my skin is better (from psoriasis, but also generally softer and clearer), I sleep better, I’ve got more energy and I don’t think about food (you know when you’re on a diet and ALL you can think of is your next meal??). I am not rigid and I don’t follow a special plan or rules (because then I would go crazy), and I do have a cheeky sweet treat every now and then and eat some oats, quinoa and couscous every now and then. Low carb is a pretty broad term as well, and I think anything below 150grams of carbohydrates per day is considered to be low. I don’t count, I eat when I am hungry and eat until I am full. Generally I would eat eggs and vegetables for breakfast, meat/fish and salad/vegetables for lunch and similar for dinner. Fried in butter, with cheese, cooked in coconut milk or cream, added sour cream – you name it. It makes the food taste great and it really makes me feel full. For long! Apparently fat is the only macronutrient that produces the fullness hormone CCK and therefore you will naturally stop when your body has had enough food; if you cut the crap and eat real food with real fats. Today I had a 3 egg cheesy omelette (with the yolks – I know, I know, crazy right?) for breakfast and it will keep me full for about 4-5 hours. No need to eat all the time or think about your next meal, because your body is satisfied with the fat. Try it! There will be a part two about being active and training/competing with a LCHF lifestyle, because this is a concern for many; not eating carbs and still having the energy to be active. Follow me on Facebook and Instagram (@awesomeashild) to make sure you don’t miss out. This entry was posted in Interesting Things About Food (Mostly), Psoriasis and tagged Carbs, Food, Full Fat, Healthy Lifestyle, Homemade, If It Makes You Feel Good It Can't Be That Bad For You, LCHF, Low Carb, Low Carb High Fat, Natural, Obesity, Sugar, Tasty, Weightloss, whole grains. Bookmark the permalink. love it – the yoghurt is scary hey. 19g in the one I was eating last year! 19g!!! 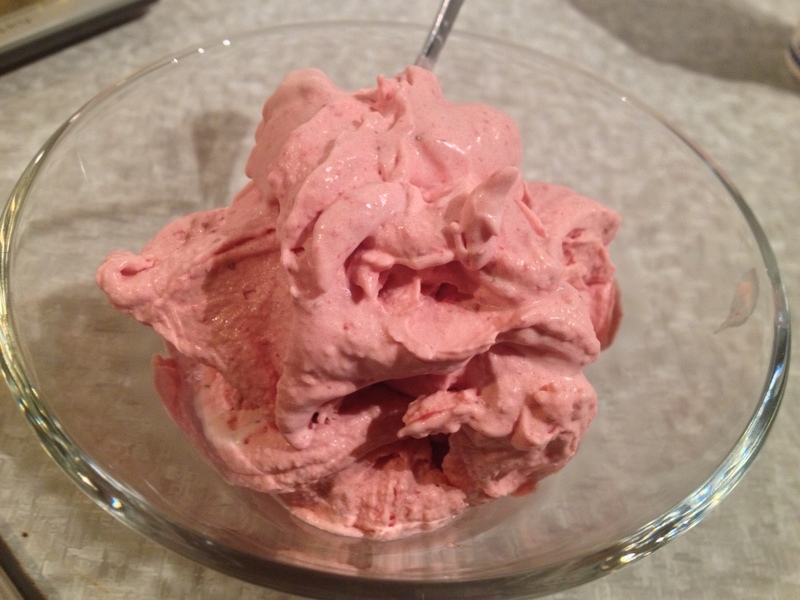 I saw one yesterday 0% fat – 26g of sugar! 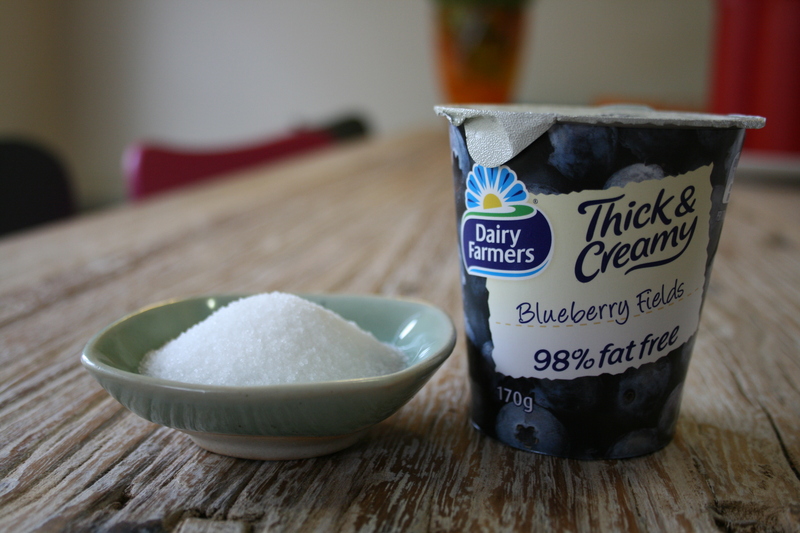 so many people think they are doing the right thing eating ‘healthy low fat yoghurt’ and so many dieticians and nutritionists pushing it too – sad really! I know – and a whole heap of rubbish about how lchf is a dangerous fad keeping people from trying it themselves. Yeah, yoghurt is a pretty interesting topic..Just like jelly candy, they use gelatin from pig hide/skin.. Nice thought! Yay!! I can recommend several books (easy reads!) if you’re interested in learning more about LCHF or similar 🙂 We need fats! I think I found my food twin! Stick to the outer aisles of foodstores and you’ll have practically every ingredient needed to make practically anything – let Awesome Âshild explain more. I loved this post because it’s full of truths; truths that I’ve lived my entire life (as you did) and KNOW to be real. Basic, real ingredients are all that are needed to have a healthy, well-rounded, nutrient-filled meal – oh yeah, add common sense and creativity in there too, lol! Keep up the good work! Include the portion sizes for the items and the amount of food that you put in your mouth is what matters most. At this point, approximately 70% of all processed foods in our grocery stores contain at least one try and you will simply gain weight back.